It's official, the global services economy is changing faster than ever. This recent research polled more than 400 consulting and professional services firms around the world to reveal the core drivers of the current market transformation, as well as the biggest opportunities for today’s business leaders. 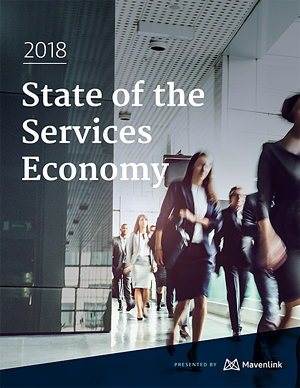 For the second straight year, leading market research firm, Research Now, partnered with Mavenlink to survey hundreds of consulting leaders to determine the state of the services economy, including top trends, challenges, and priorities. If last year’s report was about recognizing change, the 2018 report is about taking initiative—encompassing discipline, creativity, and resourcefulness. It builds on last year’s findings to help fee-for-service organizations understand the near-term opportunities and key practices of top performers in order to find success in the year ahead.